Home » Blog2 » Blog » Is The Best Camera for Your Vacation A Phone? Is The Best Camera for Your Vacation A Phone? Why the Best Camera for Your Vacation Might Not Be A Camera! Is The Best Camera for Your Vacation A Phone? 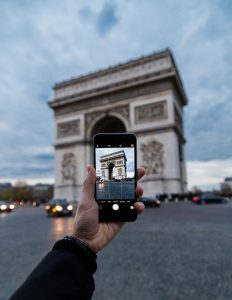 Most people want to take at least a few photos on their vacation, but not everyone wants the fuss of packing and keeping track of more electronic equipment. Have you considered leaving your digital camera at home and simply using the built-in camera on your smart phone? It’s always with you…pretty much always. When you travel, your smart phone is likely already serving several purposes beyond just being a phone. It’s a watch, a GPS, a weather-checker, flight tracker, and an email and social media connector. It’s unlikely you go many places without it, and it’s second nature to just have it on hand. (If you’re like many people, the challenge of owning a smart phone is actually limiting how much time you spend on it.) How many times have you gone somewhere and accidentally left the camera in the hotel room or in the car? Using your phone can help ensure that you’ll have a great camera handy when those moments-to-remember come up. It takes surprisingly high-quality photos. Most phones now have an 8 megapixel (or higher) camera. That’s high-resolution enough to get a clear 20” x 24” print! No messing around with memory cards or uploads to your computer. You always have the option, of course, to upload your photos at any time to your computer. But with your smart phone, you can also instantly upload images to Facebook, send them in an instant message. You can also email them to yourself or others, or back them up on a cloud service. No cords or memory cards required. Interesting apps galore can make your images look pro in no time. Free apps like Instagram cheap apps like Hipstamatic ($1.99) are used by millions of hobby and professional photographers every day. You can crop, add frames, apply filters, and share your photos right from the app itself. Further, edited photos are automatically added to your phone’s photo library. There are hundreds of photo editing applications available. You never know: you might be inspired to get more into photography through your mobile device than through an actual camera! In addition to being able to send any photo in your phone’s photo library to any camera shop or retailer (like Target or Walgreens), Instagram’s unique square format makes for beautiful, artistic prints, too. Check out MixTiles (link name to this ==> http://www.mixtiles.com/) — a free app that allows you to select and order three professionally-printed images from your Instagram library that are mounted on lightweight 8” x 8” backer board for easy hanging — all for just $49. Each additional tile after that is just $9. A 21st-Century take on the “wish you were here” postcard. You can send personalized postcards to friends and family in less than 30 seconds – without stamps or trying to find a post office. Postagram is a free app that lets you upload vacation images from Instagram, Facebook, or your phone’s photo library and then add a short personal note. You enter the recipient’s address, and voila! — Postagram prints your photo and message on high-quality glossy paper and mails it directly for you. It is a fast, convenient, and personal way to keep in touch with those you love while you’re away. Gone are the days of grainy, tiny images on small screens. 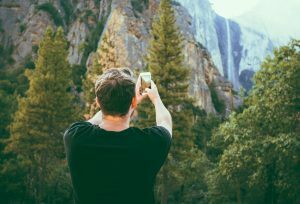 Today, even those who consider themselves photo enthusiasts love the convenience and creative challenge of using their phones to capture their most treasured photographic moments. With all that your smart phone can do, maybe this is the year to take your vacation photography to new heights! This is why the best camera for your vacation may be your phone. One note for my African Safari clients – NOTHING replaces your serious photo gear! If you have your phone ready, I’m ready to help you find the perfect place to start taking pictures! You can contact me today to help you start planning your summer getaway – just click above for your complimentary dream trip design session! Also please check out: How to plan your multi-city land vacation.